This is my annual New Year’s post about establishing the discipline of devotion. I hope it encourages you to new depths of intimacy with him this and every year! Nothing is more essential to experiencing the riches of God’s grace than our regular time with him in prayer and study. However, disciplining yourself to spend time with God can be a daunting task. Here are a few tips and suggestions to help you on your way. Set a specific time—ideally the same time every day. I believe there is real wisdom in setting aside the first part of your day for this time of intimacy with God. As I’ve suggested elsewhere, the Scriptures seem to commend the practice of rising early to meet with the Lord. Choose a specific place—again, ideally the same place every day. Having a place set aside will help you to stay focused in your time. Start with a small amount of time (ten or fifteen minutes) and slowly work your way up as you become more disciplined. I would even suggest setting a timer if you are just beginning—perhaps five minutes for reading the Word and five minutes for prayer. Ask God to give you the discipline and persistence you will need. Keep the purpose—to grow closer to God and in godliness—in your mind always. Just as practicing scales on a piano takes on new significance when you hear the sonata you hope to play someday, so picturing the relationship you hope to have with God will give meaning to these times. This shouldn’t be mere ritual. The two essential components of your time with God are prayer and time in the Word. There are many other fruitful disciplines, of course, such as fasting, solitude and silence, and meditation. But to begin, focus on these two essential disciplines. Here are some suggestions for these two activities. Keep a prayer journal so that you maintain focus in prayer. You are far less likely to let your thoughts wander if you are writing as you pray. Keeping a prayer journal also gives you a record of God’s faithfulness in hearing and answering prayer. Pray through Scripture to ensure you are praying God’s will and learning from the example of prayer warriors in God’s Word. Take time to listen to God. Make sure the conversation isn’t a one-way street. Include a time of silence in which God can speak to you. Reading through the Bible in a year can be difficult. If you fall far behind, start over at the current date and try again. Remember which days you missed, and try to read them when you have extra time. But always being behind can lead to discouragement and ultimately giving up. Don’t quit! Pick up on the right day and press on. Read the Bible with a pen in hand. That is, don’t settle for just reading the Word; study it. When doing study, start with the “then and there”questions: what did this passage mean in its original context? A good study Bible will help you enormously in this regard. Who are the people in this passage? Where and when is this passage taking place? Look at key words, structure, emphasis, repetition, tone, genre, and the relationship between ideas (such as cause and effect, questions and answers, etc.). Then ask the “here and now” questions: what does this passage mean for me today? Do I need to change my thoughts, words, or actions in light of this passage? Is there truth I need to accept, where before I had clung to a lie? Are there promises to believe? warnings to heed? examples to follow? How should this passage change my relationship with God and/or others? Meeting with God every day is an expression of our love for him and our desire to know him more. We do not meet with him because we should; we meet with him because we long to. He alone has the words of eternal life (John 6:68); in his hands alone are found pleasures forevermore (Psalm 16:11). Start today—and enjoy the richness of fellowship with the Almighty God. This is my annual New Year’s post about reading through the Bible in a year. I hope you will choose to discipline yourself and discover the riches of God’s Word in this way again this year! As the new year rolls in, we would be wise to plan for the coming year. We accomplish few things of lasting value without having planned for them in advance. This is true for our spiritual journey. Now, at the start of the year, is the time to plan for how we will encounter God in his Word for the next twelve months. Below are several excellent Bible-reading plans available to download from different ministries. Before getting to them, though, I want to discuss why a yearly Bible-reading plan is a wise idea. Why Read through the Bible in a Year? Reading through the whole of Scripture regularly is an absolute necessity of the Christian life. I can think of at least three reasons why we should undertake this endeavor every year. We are to receive strength for each day. Just as our bodies need food every day, so our souls need the nourishment of God’s Word. In the prayer Jesus taught us, we ask God, “Give us this day our daily bread.” And yet, doesn’t he say elsewhere, “Man shall not live on bread alone, but on every word that comes from the mouth of God” (Matthew 4:4)? The bread we should hunger for most is the Word of God, of which we must daily partake. We are to delight ourselves in his Word. A yearly Bible-reading plan is not a chore to be checked off our to-do lists, but an expression of our desire for intimacy with God. We long to hear his voice, as a wife longs for conversation with her husband. The psalmist expresses it thus: “I meditate on your precepts and consider your ways. I delight in your decrees; I will not neglect your word” (Psalm 119: 15-16). Is this the cry of your heart? We are to understand the whole counsel of God. It is imperative that we know the whole of God’s Word thoroughly. Too often we settle for a few scattered verses known well and applied willy-nilly to every circumstance. This has dangerous consequences. I know of no heresy—ancient or modern—that does not spring from a right understanding of part of God’s Word only. Most moral error stems from the same neglect. The writer to the Hebrews felt this frustration with his wayward flock: “We have much to say about this, but it is hard to make it clear to you because you no longer try to understand. In fact, though by this time you ought to be teachers, you need someone to teach you the elementary truths of God’s word all over again. You need milk, not solid food!” (5:11-12). To know God’s Word fully ensures that we know all that he has to say on any given subject, and can rightly apply it to whatever vicissitudes we face. Of course, this is not to say that Bible-reading plans do not come with pitfalls. The Scottish pastor Robert Murray M’Cheyne listed some in a letter to his congregation, before giving his reading plan (included below). These dangers include mere formality, in which reading becomes a lifeless duty; self-righteousness, when we impress ourselves with our outward piety; overhasty reading, when we read to finish reading and not to encounter God; and having the plan become a burden rather than a joy. And yet, M’Cheyne felt the benefits outweighed the potential dangers, which we might guard against. I agree. What are the benefits? First, a Bible-reading plan guarantees that we read the entire Bible over the course of a year (or two). Without a plan in place, this is unlikely to happen. As few of us remember what Nahum has to say, though all of us would agree we should, we must ensure we read systematically through Scripture. Second, a guided tour of the Bible keeps us from having to choose what to read each day. If left to our own devices, we would likely choose beloved passages only (neglecting the whole counsel of God) or a shorter portion than is necessary. How often do we sit thumbing through the pages of our Bibles, waiting for some inspiration to stop us in our tracks? A Bible-reading plan provides the direction we need. Third, especially among families or groups of friends who are following the same plan, we enjoy greater spiritual conversation, as we are all equipped to discuss the same passages that day. We are all different, and every year we will find ourselves in different places. Choose a plan that works for you—and that you believe you can handle for the coming year. Here are some excellent plans to consider. Discipleship Journal’s 5x5x5 Bible Reading Plan: For those who are just beginning, this plan will take you through the New Testament only—in just five minutes, five days a week. A helpful tool (even if you are doing another plan) is the 5 Ways to Dig Deeper, ensuring that your reading is neither too hasty nor mindless. Discipleship Journal’s Bible Reading Plan: My personal preference, this plan takes you through the whole Bible in one year, starting in four different places. The Old Testament readings tend to be longer, allowing you to spend more time in meditation on the shorter New Testament passages. For those who might fall behind, this plan rather helpfully has readings on only twenty-five days each month. The Gospel Coalition’s For the Love of God Plan: Following Robert Murray M’Cheyne’s plan—once through the Old Testament, twice through the New Testament and Psalms each year, starting in four places—this plan also includes a wonderful, short devotional by D.A. Carson on the day’s readings. I highly recommend this plan, especially for veteran readers. 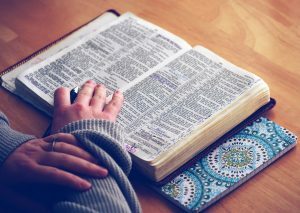 Heart Light’s Daily Light Reading Plan—New Testament with Psalms and Proverbs: Another shorter plan, this will guide you through the New Testament during the week, with readings in Psalms and Proverbson the weekend. An excellent starter plan. Heart Light’s Straight through the Bible Reading Plan: This plan takes you through the whole of the Bible in canonical order—Genesis to Revelation. While it has drawbacks—such as reading through laws and genealogies all at once—there is tremendous benefit to seeing the plan of God’s redemption unfold in history. ESV’s Chronological Bible Reading Plan: An interesting approach, perfect for those who have been through the Bible a few times already, this plan takes you through Scripture chronologically rather than canonically. In other words, the prophets, psalms, letters, etc. are inserted at the correct moment into the narrative flow of God’s redemptive history. Whatever plan you choose, I hope and pray it will be a great blessing to you, as you devote yourself to knowing God—and his Word—more completely this coming year. Disciplining yourself to spend time with God can be a daunting task. Here are a few tips and suggestions to help you on your way. Heart Light’s Daily Light Reading Plan—New Testament with Psalms and Proverbs: Another shorter plan, this will guide you through the New Testament during the week, with readings in Psalms and Proverbs on the weekend. An excellent starter plan.